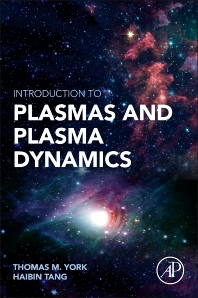 Introduction to Plasmas and Plasma Dynamics provides an accessible introduction to the understanding of high temperature, ionized gases necessary to conduct research and develop applications related to plasmas. While standard presentations of introductory material emphasize physics and the theoretical basis of the topics, this text acquaints the reader with the context of the basic information and presents the fundamental knowledge required for advanced work or study. Covers a range of applications, including energy conversion, space propulsion, magnetic fusion, and space physics. Engineers and early career researchers working on plasma applications. Undergraduate and postgraduates students in thermal engineering, fluid engineering, and physics. Dr. Thomas M. York, currently a consultant in aerospace and energy applications, was Professor of Aerospace Engineering at Penn State and Ohio State universities; he also served as staff in the Office of Fusion Energy and Office of Energy Research, US Dept. of Energy. He has an extensive background in National laboratory research collaboration (Los Alamos, Livermore, USAF Astronautics, NASA Labs.) on experimental and theoretical plasma studies. He has specialized in aerospace gas and plasma dynamics, plasma diagnostics, space propulsion, magnetic fusion studies and ionosphere studies. Professor Haibin Tang is Deputy Director of the Department of Aerospace Propulsion School of Astronautics at Beihang University, Beijing, China. His research interests include plasma and fluid physics, advanced propulsion and space systems, numerical modeling, and experimental measurement. School of Astronautics, Beihang University, China.